Reason & emotion | ADULT CATECHESIS & CHRISTIAN RELIGIOUS LITERACY IN THE ROMAN CATHOLIC TRADITION: hosting ONLY True Christians!! !, or "How to think Catholic!!" “The Scottish philosopher David Hume famously claimed, “Reason is and ought only to be the slave of the passions.” In recent years, growing public awareness of the centrality of the emotions and desires to the human experience has superseded an earlier emphasis on emotional restraint. From psychoanalytical therapy to the emergence of a therapeutic direction in our justice system, the effects of this revolution in thinking are hard to overestimate. In many ways the changes are positive. Empathy, mutual understanding, and self-reflection now receive a healthy emphasis. Our culture encourages us to tolerate others and see alternative points of view as we try to appreciate each person’s background and emotional experiences. However, there is a major problem in the usual application of this ethos. Desires, we have come to believe, justify themselves. When asked why we do something, we say, “Because it feels good;” when asked what our opinions are on a political matter, we reply, “I feel…” Yet we need only to look at the example of emotionally motivated murder to realize desires are not self-justifying. St Thomas Aquinas, writing nearly 800 years ago, built upon Aristotelian notions of the passions and the appetites to develop a corrective picture of the human psyche. He demonstrates why desires cannot be self-justified and how we can positively proceed, neither denigrating human emotion below its rightful place nor exalting it to heights that can only precede a fall. Aquinas’s passiones animae, translated as “emotions,” do not only refer to passions in the modern sense of overwhelming and perhaps incapacitating feelings. Instead, they refer to our reaction to the nature of every object or situation. He thinks we react in two ways, either to the object itself or to the difficulty we face in trying to obtain or avoid the object. For example, as a child I desired a dog. Dogs are naturally lovable, so I loved them and desired one for myself. This is the first type of emotion— what Aquinas calls concupiscible emotions—which entails having an emotional response to an object because of that object’s inherent nature. My parents, on the other hand, were not so amenable to my idea, and prevented me from fulfilling my desire for an adorable dog. Frustrated, I courageously fought for a puppy but eventually gave up hope and despaired of ever having one. Because my parents had stopped me from obtaining my goal, I was angry with them. Anger, courage, hope, despair—these are all emotions of the second sort, the irascible emotions; they describe our reaction to our perceived ability to obtain an object of desire. Aquinas thinks that both types of emotions have a close relationship with reason. In fact, he thinks our reason in a way rules our emotions, “not by a ‘despotic supremacy,’ which is that of a master over his slave; but by a “politic and royal supremacy,’ whereby the free are governed who are not wholly subject to command.” Eventually, I realized that a lasting anger at my parents was unreasonable and that I should probably encourage my anger to subside— and it eventually did. 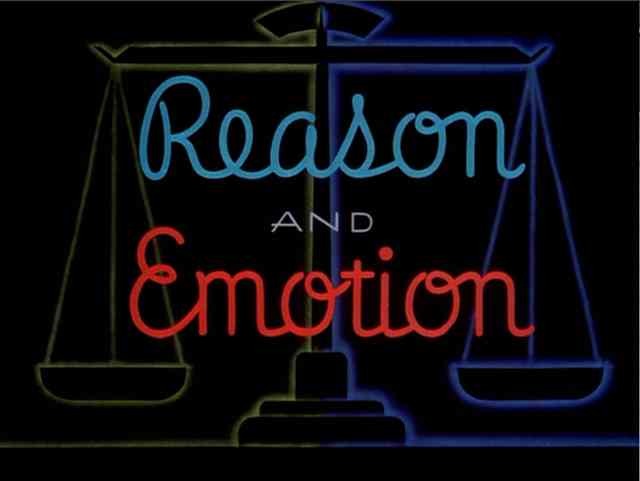 Reason and emotions, then, enforce each other day by day. Aquinas grounds his understanding of emotions in the infinitude of little impulses that arise spontaneously throughout our normal experience. Focusing too heavily on extreme cases has largely skewed popular culture’s conversation on the relationship of emotions to reason. Usually, the impulses of our sensory appetite (emotions and passions) align quite closely with our reasoning abilities and our intellectual apprehensions. For example, in a given day, we desire to eat food, we want to complete tasks, and we try to care for our friends. While there are cases of overwhelming emotions, most of our life is more accurately described in little impulses of joy or sorrow, hope or despair, that we can encourage or check with our intellect and reason. The question remains, however: what impulses ought we to encourage? Well, passions must be appropriate to their objects. In order for this to be true, apprehension must precede desire: we must know what something is before we want it. For example, I must know about cake before I can want cake. Once I have apprehended that the cake is sweet and delicious, I will then desire it. If I thought it was a pile of mud rather than chocolate cake, I would believe it to be distasteful and undesirable. Clearly, correct apprehension leads us to experience passions appropriate to the object. Only in light of the ‘appropriate’ can we understand the greater value and purpose of passions. Emotions and desires, as aspects of the everyday, carry moral weight. We can make judgments as to the appropriateness, the goodness or badness, of our emotions. Aquinas writes, “in so far as they are voluntary, [passions can] be called morally good or evil. And they are said to be voluntary either from being commanded by the will, or from not being checked by the will.” Before competing in a race or a game, we can voluntarily work up positive emotions; in response to someone cutting us off while we drive, we can discourage our anger and try to remain levelheaded. Emotions are both reactive and willed, and their origin need not necessarily describe how we then respond to them. Measures of good or bad can refer only to voluntary impulses. But when, if ever, are emotions voluntary? Our lives are a history of partially voluntary actions and reactions. Humans learn many things through experience, and as an essential part of this experience, the emotions help develop our habits. Even our instinctual drives, like the drive for food, can become more and more voluntary as we get older. Not only do we learn to like a broader range of foods (I learned to like onions only as an older teenager), but we also learn to have “will-power” in to restrain our consumption of some foods. As one of Aquinas’s commentators has said, by deciding which impulses we encourage and discourage, which emotions we try to check, we “tell our life story.” The choices we make now both reveal our current preferences, and encourage specific future preferences and future choices. Thus, it is impossible to be sure that an emotion is voluntary or otherwise in the moment: we have to understand ourselves as beings progressing through time. We do know, however, that emotions can be scrutinized according to moral standards. If we can judge our emotions, how should we do this? We judge emotions based upon their relation to the person about which they arise and in relation to their object. Our emotional response must be appropriate to the context in order for it to be good. By our will, which we inform with our reason, our desires, and our emotion, we plan our path of action. Reason informs us when our path is contradictory— when our plan will not bring us to the goal that we willed. For example, competitive sports highly prize the quality of being a good loser. An overreaction to a loss comes off as immature. On the other hand, athletes who are apathetic to winning not only are less likely to succeed, but do not have enough emotion invested in the sport. Our reason must balance these many impulses, neither neglecting self-control nor suppressing a healthy passion. Over time, reasoned responses discourage inappropriate emotions and encourage appropriate ones. Eventually, I might not even have to really focus to keep my temper—it may start to come naturally. The joy of competition does not contradict a healthy appreciation for sportsmanship. Reason can balance our particular goals with our particular situation. But there is a more fundamental way that the will, the reason, and desire all work together. One particular desire underlies all our other impulses: the desire for the good, for happiness. We cannot help to desire to be happy— it is our nature. If we ask ourselves why we wish to be happy, there is no answer other than “because.” Nothing transient, passing, or temporal can actually fulfill this most fundamental of desires. When we plan paths of action with our will, we are trying to fulfill this desire. Our will, as it aims at the universal good, ideally aligns the sensitive appetite (the source of desires and emotions) with the larger goal. Aquinas recognizes the universal Good in the Incarnation— God is the ultimate object of desire, the source of happiness, and the greatest good. Our nature, to use modern terms, is programmed towards God, and in so far as we either pursue or reject God, we expand or limit our opportunity for real fulfillment in this world and the next. Against the measure of the ultimate good, our desires and emotions begin to fall into place. Slowly, through the building of good habits, we can desire objects and guide emotions appropriately. This is not to deny the many layers of emotional complexity. Emotional complication is part of growing up in the world, but through a growing awareness of self, we can begin to understand our emotional impulses. Through the practice of self control combined with the contemplation of God, our highest desire, we can hope to develop a greater internal unity. Our goal is to desire particular goods as the goods themselves deserve, and through the practice of virtue we begin to experience intense love and joy and desire towards objects that actually deserve that intensity of feeling.